Loved this little book curated by Jamie Chalmers from first look and touch. It is the perfect size to present work that is often somewhat diminutive, and fits the hand well for a long sit down and read. I read the book from cover to cover within the first 24 hours and loved every minute of it. 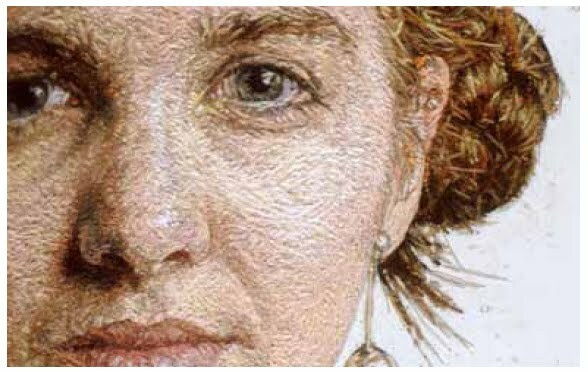 There are 30 top stitch artists in the book with a lovely spread of each one including lots of photos of work, insightful interview questions, and lovely details to bring the work up close and personal. The first two photos are from a portrait done by Cayce Zavaglia from the USA. She has masterful use of space and thread color. As well done as any portrait in oil. 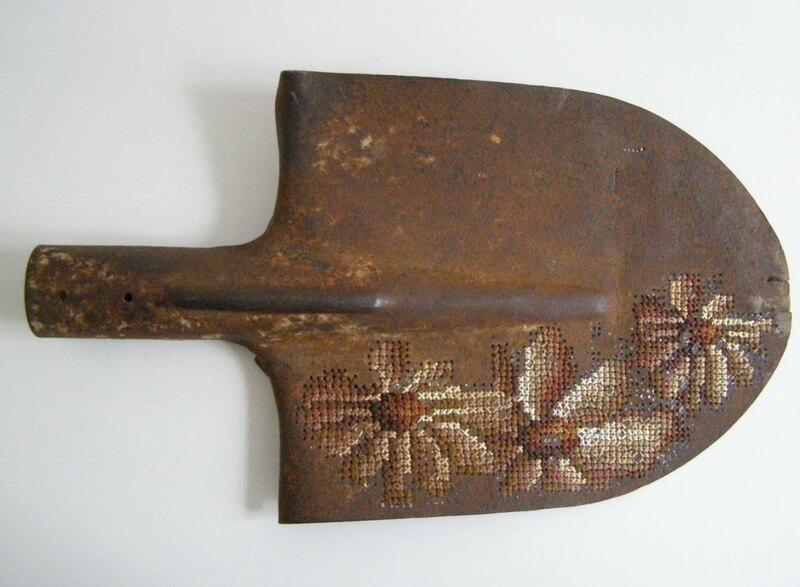 Yes, that is a shovel that has been drilled and cross stitched by Lithuanian Severija Incirauskaite-Kriaunevciene. In Root Deep Meagan Ileana plays with the female form in just a touch of hand and feet with a strong sense of the goddess. I want a pillow. Charlene Mullen of UK is best known for her blackwork embroidery of London landscapes. She has really pushed the envelop on taking "craft' at its most mundane level of both form and method and pushed it to art. 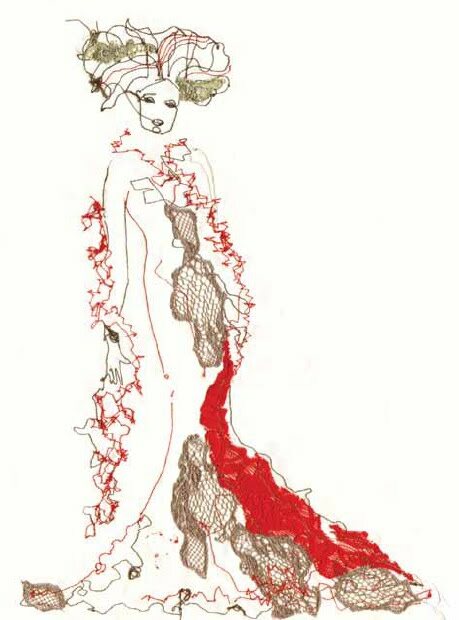 And the Lady in Red by Marloes Duyker, Netherlands, is a testament to what heights one can take free motion embroidery and a few bits of old lace. This is a book that I will love and enjoy for many years to come. Great News! Just got an email from Lark, that I can get a copy of the book to give away. Leave a message here, with your email address by November 10 and I will draw a random name to send the book to.